Yesterday I got to share my talented friend Katie and her budding photography business, KGC Photography. A few weeks ago Katie and I got together to play around in my kitchen and with her camera. I made lunch and she photographed. It was too fun. I felt like a celeb chef for like 5 seconds!!! At the time, I had recently shared this blog post on the Best Salads in OKC. With the post on my brain, I thought it would be fun to recreate one of my faves, the Grilled Shrimp Salad from Republic Gastropub. I recommend this salad to evvvvvveryone! It is filled with eclectic ingredients but they make it work. 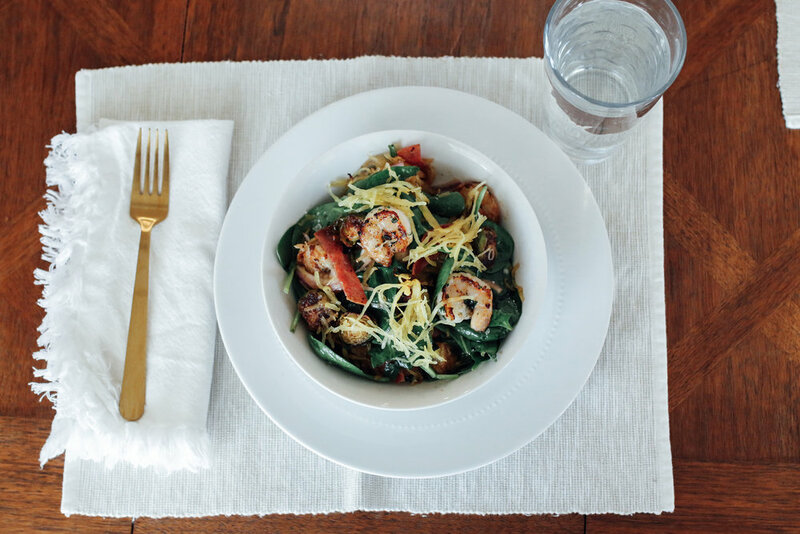 Components are: spinach, grilled shrimp, spaghetti squash, roasted brussels sprouts, crispy salami, smoked gouda cheese, red onion and tossed with a horseradish dressing. I was on Whole 30 at the time so I modified a bit, eliminating the gouda and swapping the dressing for my favorite balsamic dressing. With so many ingredients the salad takes some time, but if you pre-prep this salad it can easily be thrown together. I had already roasted my spaghetti squash and brussels and made the dressing. When it came to lunch time I just had to sautee the shrimp and toss it all together. Dressing: yields a little extra, but this is a great balsamic dressing to have on hand! *I suggest doing some prep for this salad. Pre-roast your squash and brussels and make your dressing ahead. This way everything can easily be thrown together. Preheat your over to 425 degrees. You will use the same oven temperature to roast your spaghetti squash and brussels sprouts. Slice your spaghetti squash in half and scrape out the seeds. Season with a drizzle of oil, salt and pepper. Place in a baking dish and roast cut side up for 45 to 50 minutes, until fork tender. Now prep your sprouts. Cut the bottoms off your brussels sprouts then slice them in half. Place on a roasting sheet and generously coat them in oil, salt and pepper. Once there are 25 minutes left of the squash, pop your sprouts into the same oven. Roast for 25 minutes until browned and crispy. Heat a pan over medium heat. No need to oil the pan, your salami has enough fat in it. Cook your salami in a pan for about 3 minutes on both side, transfer to a plate lined with a paper towel to absorb the grease. Keep the pan, we will use it in a bit to cook the shrimp. Cut the crispy salami into long strips and set aside. Now time to make the dressing. In a small mason jar or in a small bowl combine the mustard, olive oil and balsamic vinegar, salt and pepper and red pepper flakes if you are using them. Shake or whisk to combine. Once your squash, brussels and salami are all done, it’s time to prep the salad. In a large bowl place your spinach, sliced red onion, sliced salami, and brussels. Fork one half of spaghetti squash to create strands. Fork them right into the salad ingredients. Give the salad a good drizzle of dressing and toss. Final touch is the shrimp. Over low-medium heat, add 1 tablespoon of oil to the pan with the salami drippings. Add minced garlic and cook for 1 minute, being careful it doesn't burn. Add shrimp to the pan then sprinkle over salt and pepper over the top. Cooking for 2 minutes on both sides, until pale pink. Increase the heat to medium high and add 1 tablespoon butter or ghee. When the butter starts to foam add your chopped parsley. Stir the shrimp around until it is all coated in the buttery parsley. Immediatly plate, adding 4 pieces to each salad. All photos by KGC photography, see more of her work here.